Recently I covered different types of watercolor paper on the market, as well as my favorite brands. But now that you have your watercolor paper, what else do you need to know to get started? Why, how to stretch, of course! I've written about stretching watercolor paper a couple times in the past, so rather than beat a dead horse, I'm going to point you to this excellent post of mine, written in November, on how I stretch watercolor comic pages. Not only does this post include photos and step by step written instructions, but it also links to the Watercolor Panel Heidi Black and I presented at Mechacon 2014, which includes a live stretching demo. The methods outlined in the above post are a combination of techniques learned from various sources. While taking printmaking (four classes worth), we were taught to soak our printmaking paper in a cold water bath for 20 minutes to prepare it to accept ink. Most artist quality papers have sizing (generally gelatin based) on the outside and interior of the paper to give it structure- stretching your watercolor paper using the methods described in the above linked post and covered in my Mechacon Panel will not dissolve the gelatin in the paper as we're using cold water. In general, you do not ever want to use hot or warm water in relation to watercolors- hot water will dissolve the glue that holds the hairs in your brushes, hot water will dissolve your sizing, hot water can effect your paints differently than cold. So as long as you stick with cold water, you should be fine for stretching. Post UNO, I continued to pursue my interest in watercolor, and studied under David Gildersleeve while at SCAD, as well as pursuing watercolor education online and via books. My stretching methods are a combination of the above. I use a particular brand of crepe paper blue masking tape- 3M Blue- as I've tested several other brands of masking and artists tape (including watecolor tape) and find that this brand works best for the papers I use, with minimal ripping. Watercolor tape is not meant to be removed from the paper- you are intended to cut your paper away- which does not work for my method of creating watercolor comics. I started out using lapboards as a stretching surface, but have found corrugated plastic Gatorboard (like political sign boards) to be superior- non absorbent, will not splinter, lightweight, very cheap, can easily be cut to size. If you are painting watercolor comic pages like I do, and are using 11"x15" or 11"x14" watercolor paper, simply cutting a 30"x24" sheet of Gatorboard in half will provide you with two stretcher boards. 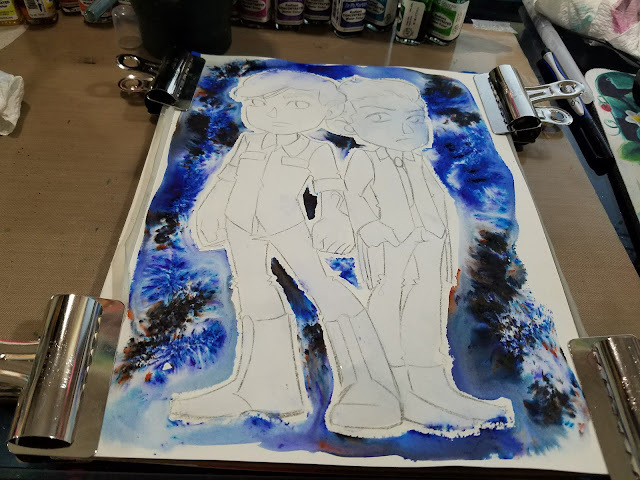 Different artists have different ways of stretching watercolor paper for painting, and the above references are how I stretch almost everything I paint- from 7" Kara pages to Gizmo Grandma illustrations, to larger commissions. It's a method that works well for me, but it may not work for you. If you find that it does not, don't feel like you have to use it- what's important is finding a method that works well for the work you produce. I've linked alternate methods at the bottom of the post, if you need help finding other resources. If you have an alternate method you would like to share that is not covered below or in my Outside Resources, please let me know, I'd love to check it out and give your work a signal boost! Chapter 6 cover featuring Naomi, from 7" Kara, my ongoing watercolor comic. When you properly stretch your pages, they may buckle a little bit while soaked, but will dry straight. These pages are easier to work with while painting, easier to scan, and easier to store. Your paper buckles, and paint pools unevenly, making it difficult to control. Stretching your watercolor paper can make a huge difference in how your finished pieces look. If your paper is on a block, it's already stretched, so you're ready to start painting! Stretching your watercolors will make the graphite on your paper permanent, so you don't need to use inks if you don't wish, but you also can't easily make corrections to your lineart. If you want to print your bluelines using a desktop printer (non toner based) make sure you do so before stretching the paper, and finalize your lineart (either inks or pencils) beforehand, as stretching it will reactivate the printer ink and wash it away. Since you guys should be familiar with my preferred stretching method, I'm going to introduce some alternate methods used by myself or by friends for the rest of this post. The art on this watercolor paper is by the fabulous Eve Milady, and is used with permission. Go check out her work on Instagram! This method works well for small pieces- just clip your piece down on all sides with some strong bulldog clips! The clips should hold the paper taut enough that the paper won't be buckled when dry, but this technique is best if you have a light hand with water. Watercolor blocks are gummed on at least two sides, often four sides, to hold your paper taut. These are perfect for field work or quick commissions, as you don't need to spend time stretching your watercolor paper. These may not run through your printer, so you'll have to either do a graphite transfer or sketch on the paper surface directly. Sometimes watercolor blocks don't do a great job of holding the paper down, so you may need to augment with some handy bulldog and binder clips, as shown with the commission below. These types of boards all have sufficient internal structure to prevent your watercolors from warping and buckling the paper. Some are a combination of watercolor paper+chipboard, others are watercolor paper throughout. Some are even watercolor ground on masonite board, like Aquabords. Since this isn't watercolor paper at all, but watercolor medium or gesso applied to masonite board, the watercolors do not actually absorb into the ground. Aquabords take ink readily if you don't mind the textured surface (more like sandpaper than Cold or Rough press). Although this Montval Art board did not warp, the artboard is only as good as the paper on it, and Montval isn't a particularly high quality watercolor paper. Artboards are ideal for field work. This works decently well for smaller pieces or pieces that I intend to use as a demo. If you watch my YouTube channel, you'll notice that I utilize this technique. I don't always use wide blue tape to secure my illustrations to a hard surface, nor do I always attach them to Gatorboard. Sometimes, like for this handmade Shinzen watercolor paper, I just tape the edges, so I have as much space as possible to paint. And I often use regular white crepe masking tape. Which can also be used as a palette of sorts to blend watercolor markers on. You can purchase the original from my shop,and help support this blog. This method did not work particularly well in the above example as the water seeped through the Lantgon Prestige watercolor paper, making the Tombow removable adhesive less prone to sticking. I eventually had to tape the corners down with Washi Tape, which are also low-tack. I hope you found these alternative options for stretching watercolors (as well as the traditional options) helpful, but if not, below are some alternatives to the methods shown in this post and the methods I've covered on the blog in the past. Enjoying my Watercolor Basics series? Why not send some encouragement my way by dropping me a kind line? I'd love to hear from you! You can contact me via the handy form on the left hand sidebar- it only takes a moment. And if you'd like to help support this sponsor-free blog, please take a moment to share my work to your social media. There are handy button below every post that makes sharing posts super easy! It'd mean so much to me if you shared my work to your favorite art-related forums and communities- your good word goes a long way! Want to see more of my work? Swing by my YouTube channel for more tutorials, tips, demonstrations, and techniques, my Gumroad online shop for digital downloads of sketchbooks (both in black and white and color), downloadable lineart and digi stamps for you to use at home, and comics, or check out my Natto-shop for physical copies of 7" Kara Volume 1, mini comics, and more! Your purchases go to supporting this blog. Want to do more? Swing on by my Patreon for information on how you can join the Nattosoup community.